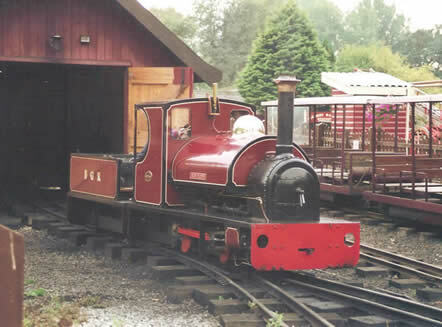 The Bressingham Garden Railway first opened in 1964 and was 9 ½ inch gauge. Trains were pulled by ‘Princess’ until 1994 and another steam engine built by A.E Salt until the 1970s. After working for many years as the sole motive power ‘Princess’ retired and the line was relaid as a 10 ¼ inch gauge line in 1995. This is the present line today. Trains run from the Garden Station and go through the late Alan Bloom’s garden, passing the B&B house, before travelling round a balloon loop and then returning to the station. Trains are pulled by saddle tank ‘Alan Bloom’ which was built in the workshops at Bressingham. BGR Page was last updated on the 1st January 2011 with picture added.